In your opinion, what were the most interesting exhibitions and fashion shows in the gallery? Which events in the life of New Artists would call key ones? 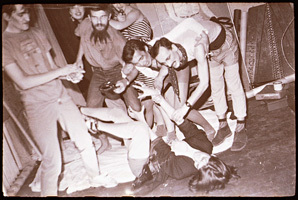 From the photo series dedicated to the promotion event for the LP cover “Nachalnik Kamchatki“, a record by the group “КINO”. 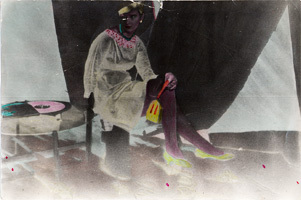 Evgenij Kozlov created the cover on request by Viktor Tsoy. 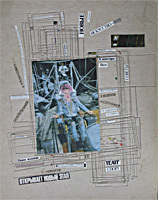 Еvgenij Kozlov, triptych, photo collage, 1984. Collection of the State Russian Museum. When it comes to other meetings, my memory also relies upon the photos: meetings with Georgy Guryanov, Viktor Tsoy, Valery Alakhov, Igor Verichev, Oleg Kotelnikov, Ivan Sotnikov, Inal Savchenkov, encounters in clubs and on the streets. But I can put the answer in a different way. The essential purpose of these meetings was to trigger a creative process, and such a process occurs not simply because different people meet. Actually, it occurs as a result of impulses provoked by something new, unexpected and unprecedented which continue to make their positive, interesting and necessary impact. In other words, it is all about a search for these new impulses. In this sense, it could be said that New Artists existed maybe not in all, but in many countries. There was a similar movement around Jean-Michel Basquiat and others in America. The difference lies in the fact that in America, unlike in Russia, this movement received financial support and reached a completely different level. After the ballet “Anna Karenina”, two large paintings were created in the same way: “Anna Karenina 1” with Novikov and Bugaev large picture >> and “Anna Karenina 2” with Gutsevich, Bugaev and Zavernyaev large picture >>. 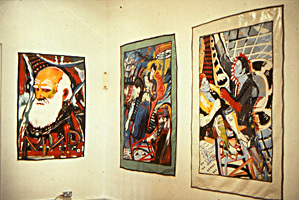 During the first large tour exhibition of the New Artists around Europe and the USA in 1988/89, these two works together with my portrait of Leo Tolstoy large picture >> were exhibited as a triptych. Although that was strange and wrong, as I did not view them as a triptych, the curators must have had their reasons. 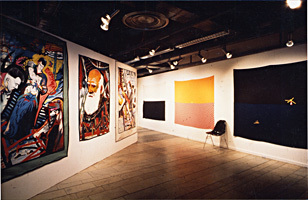 “De Nya från Leningrad” (The New from Leningrad), Ausstellung im Kulturhuset, Stockholm, 1988. 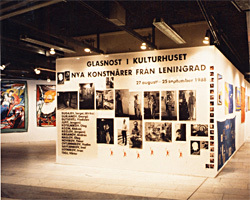 “De Nya fran Leningrad” (The New from Leningrad), exhibition at the Kulturhuset, Stockholm, 1988.